Stunning picture dam of Zandenburg Barrage! 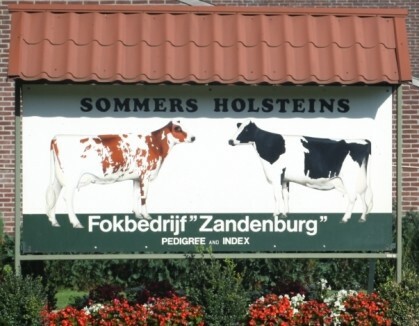 Huge classification for Zandenburg Holsteins! Zandenburg Super Camilla 1 VG-86-NL 2yr. Full sister to the Genetic Superstar: Camilla! Grand dtrs > 2700 GTPI!! RZG +156 / NVI +349 - #2 Battlecry in for NVI!! Super pedigree with > 300 NVI! Zandenburg Danno Ebony 2 VG-86-NL 2yr. Zandenburg Sundance Ebony *RC VG-87-NL 2yr. Zandenburg Iota Ebony VG-88-NL 2yr. Zandenburg Snowman Ebony VG-86-NL 2yr. Zandenburg Planet Ebony 3 VG-87-NL 2yr. Great Snowman daughter from the Ebony's! Zandenburg River Ebony 1-ET *RC VG-85-NL 2yr. gNVI RED CARRIER chart topper! Huge transmitter from the Ebony's! RZG +150 from the Helsinki family! High testing Charley dtr in several systems! Zandenburg Holsteins is a very well-known name all over Europe! 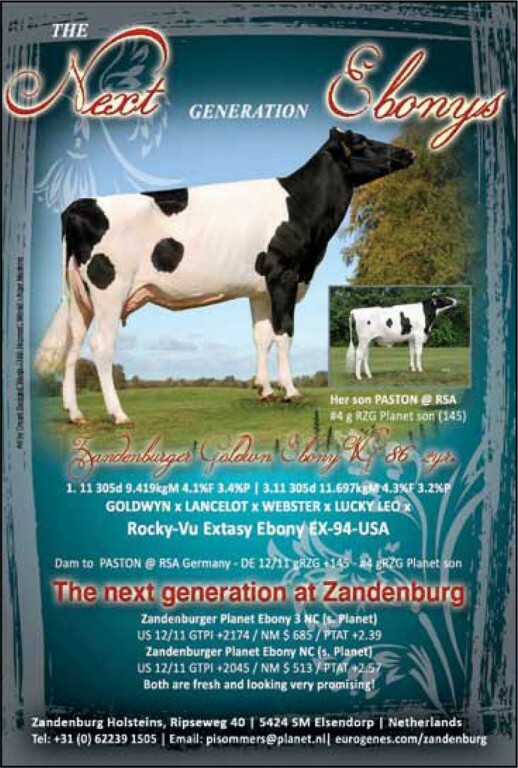 The Sommers family have developed a very interesting and successful line of the American Rocky-Vu Rotate Exctasy Ebony cow family which are now dominating in the Zandenburg herd. Zandenburg Holsteins have bred multiple successful bulls such as: Zandenburg Paston & Pazzini, Monaco (s. Snowman), Mellor (s. Missouri) and many others! Also bred by the Sommers family is Zandenburg Super Camilla VG-85-DE 2jr, who is the dam of Crossfell Rubicon Milla, sold for € 75.000 and the former #1 GTPI Female in Europe!